Tuesday, November 18th: Well, it has been a scary and wild weekend in Santa Barbara. Firestorms raged and threatened many of our friends here. Most were lucky. But approximately 150 homes were destroyed, and the lives contained therein will forever have a memory of loss, coupled with the gratefulness of survival, that is unique. I AM HERE THIS WEEK!!! I had originally thought I would be away, but lo, I will be at SBCC on Tuesday morning at 8:30 AM. Let’s all work on the miracle and gratefulness of good health together… I’m waiting for you. Each letter corresponds to the colors, in order. The colors also proceed in alphabetical order, in case you forget my little acronym So, if it is Saturday, and you see a yellow clip right in front, it could have been freshly delivered that morning… but check the expiration date… it may be only a few days away, which means that was LAST Saturday’s bread they are trying to foist on you… it’s at least a week old already! Look for a white (Friday) tag, which would mean it was delivered yesterday. The expiration date on that should be about a week away. As for the San Francisco sourdough question… there is a bacteria, Lactobacilus sanfrancisco (or sanfranciscensis) that is found only in the Bay Area air, and is the key to the sourdough bread there. Good news for Santa Barbarians…. the Honeybee Gardens eye pencils I recommended are carried at Lazy Acres, along with the Honeybee Gardens Watercolors line of nail polish. Others outside the SB area will likely find it at a good quality health food store, as well as the online link here on the blog. Nail polish is, frankly, just pure chemicals – none of them good. OPI’s offerings rank 4’s, 5’s and 6’s, Sally Hansen’s are up to a nasty 7. This Honeybee Gardens line is a water-based technology, as opposed to solvent based, and rates a 2. Quite unique. 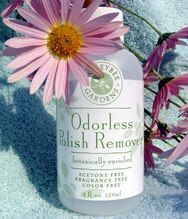 It requires its own special remover, which has no odor. Warning: This polish may be difficult to remove. Read, and heed, the directions and suggestions. Also this week…. eye shadow! Weeks of searching and a number of disappointments have finally yielded something I feel comfortable recommending. All the Mac eye shadows I was using rated 4’s, 5’s and 6’s on Cosmetics Database. 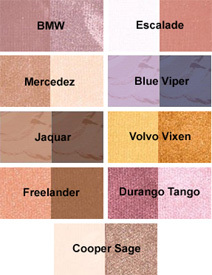 At Lazy Acres in Santa Barbara I found Emani Minerals eye shadows. Good colors, nice consistency. You will not find the products listed on Cosmetics Database, but I entered the ingredients into the database myself and got the rating… a much better 2 🙂 Here’s just a sampling of color duos… they have others in singles also.